Ovid ended Book 10 of his Metamorphoses with the death of Adonis, lover of Venus, when he was gored in the groin by a wild boar. He starts Book 11 with another tragic death, this time of the great poet and musician Orpheus. Ovid opens this book by reminding the reader that almost all the stories told in the previous book were sung by Orpheus, following his loss of Eurydice to the Underworld. His song is now interrupted as he is attacked by a mob of frenzied Thracian women – Maenads, or Bacchantes. They accuse Orpheus of scorning them, as he had. The first of the Bacchantes throws her thyrsus at him, but it only bruises his face. She then falls to the ground, enchanted by his voice and lyre. Soon, though, his music is overwhelmed by the mob, with their drums and deafening screams. 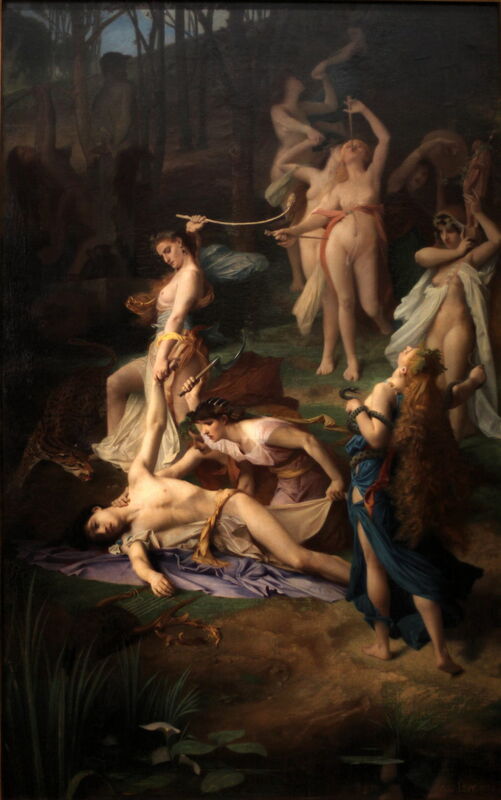 The women first kill the birds which Orpheus had charmed, then the snakes around him, and next they turn on him. A nearby group of farmworkers run away, abandoning their tools in the field. The Bacchantes seize those, and use them as weapons to bludgeon the bard’s body. He makes one last plea for his life before they kill him, and tear his body limb from limb. His mortal remains are then dispersed into the rivers: his head and lyre end up in the river Hebrus, where they still make sad sounds, as they make their way downstream and over the sea to the shores of Lesbos. Orpheus’ soul descends to the Underworld, where he is at last reunited with Eurydice. the crime of Orpheus’ death. He thrust the sharp points in the solid earth. attempted flight, was held by deepening roots. from them and covering all her graceful legs. and shoulders are transformed to rigid oak. and such a thought would be the very truth. The Bacchantes are thus transformed into an oak wood. For once, I find more recent depictions of this story in better keeping with Ovid’s account, showing the subtlety that it merits. By a strange coincidence, two of these paintings were shown at the Salon in Paris in 1866. The first is Émile Lévy’s Death of Orpheus (1866). Lévy shows the moment before the first wound is inflicted: Orpheus, remarkably young-looking, has just been knocked to the ground, and looks stunned. Two Bacchantes kneel by his side, one clasping his neck (almost as if feeling for a carotid pulse), the other about to bring the vicious blade of her ceremonial sickle down to cleave his neck open. 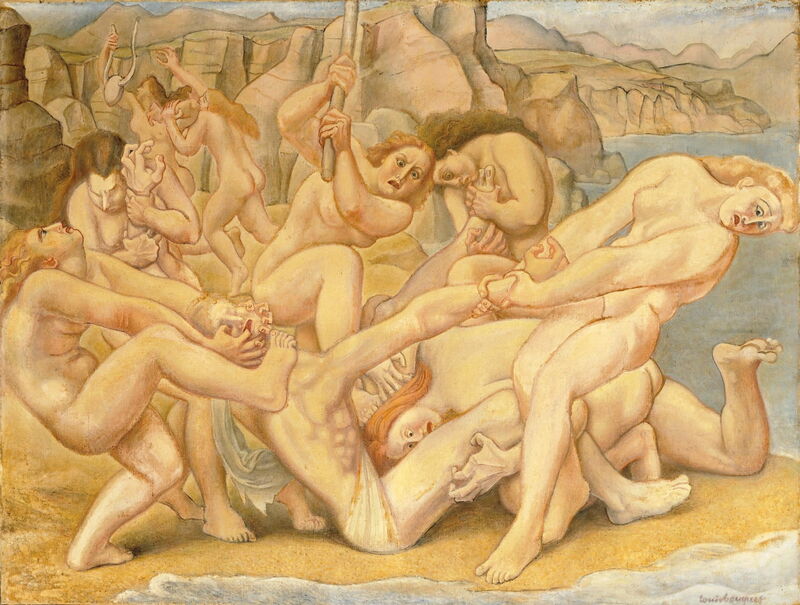 Louis Bouquet’s far more recent The Death of Orpheus (1925-39) transports the scene to a beach, where the naked Bacchantes are almost unarmed and just starting to tear the body of Orpheus with their bare hands and teeth. The second painting shown in 1866 skips ahead in the story, to the discovery of the remains of Orpheus. According to Ovid, his head and lyre were washed up on the shore of Lesbos, but here Gustave Moreau retains them in the waters of the Hebrus. 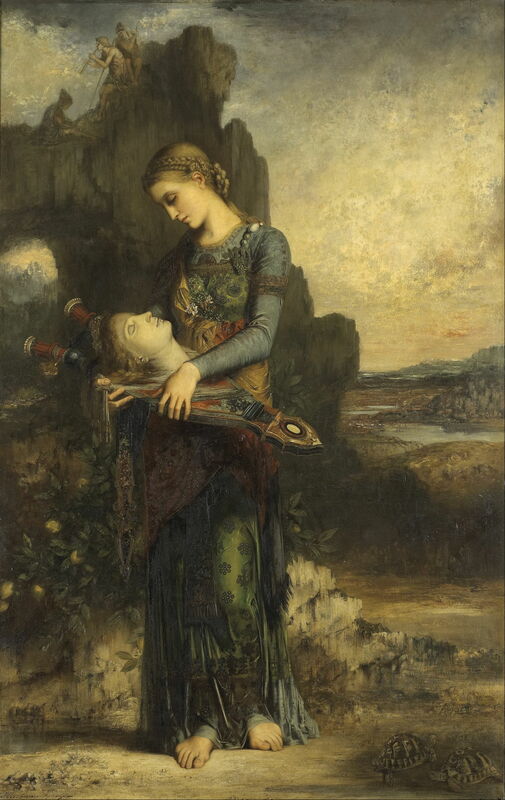 In Moreau’s Orpheus (1865), a sombrely-dressed Thracian woman holds Orpheus’ lyre, on which rests his head, blanched in death, as if affixed to the lyre like the head of a hunting trophy. Her eyes are closed in reverie. The river Hebrus is shown in the background landscape to the right. The gentle and natural beauty of the Thracian woman, her ornate clothes, flowers, and the strange beauty of Orpheus’ head on the lyre contrast with the harsh and barren landscape. Moreau has here avoided elaborate symbols and decoration, apart from two passages at the painting’s corners: three figures, apparently shepherds, on the rocks at the upper left, and a pair of tortoises at the lower right. The figures refer to music, which is in keeping with Orpheus and his lyre, but the significance of the tortoises has been harder to explain, and may be a personal reference to Moreau’s love for his partner. 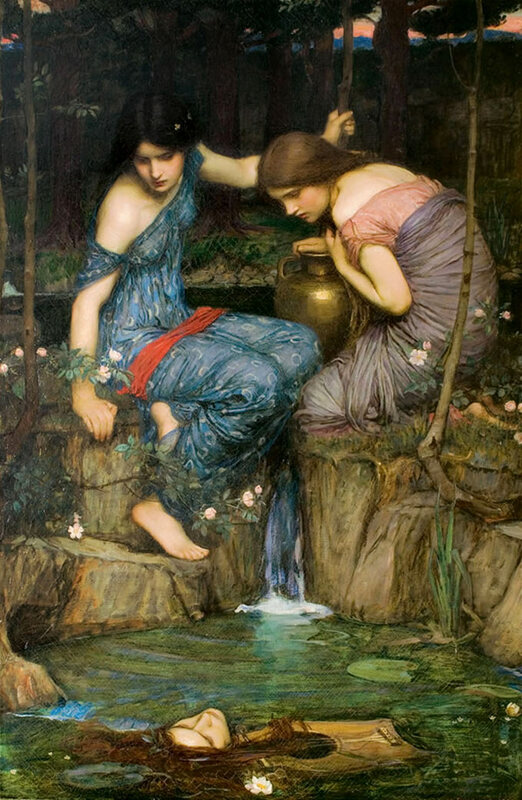 John William Waterhouse uses his depiction of this scene, in Nymphs Finding the Head of Orpheus (1900), to celebrate honesty in art, a theme dear to Waterhouse throughout his career. His painting shows two young women discovering the severed head and lyre of Orpheus. 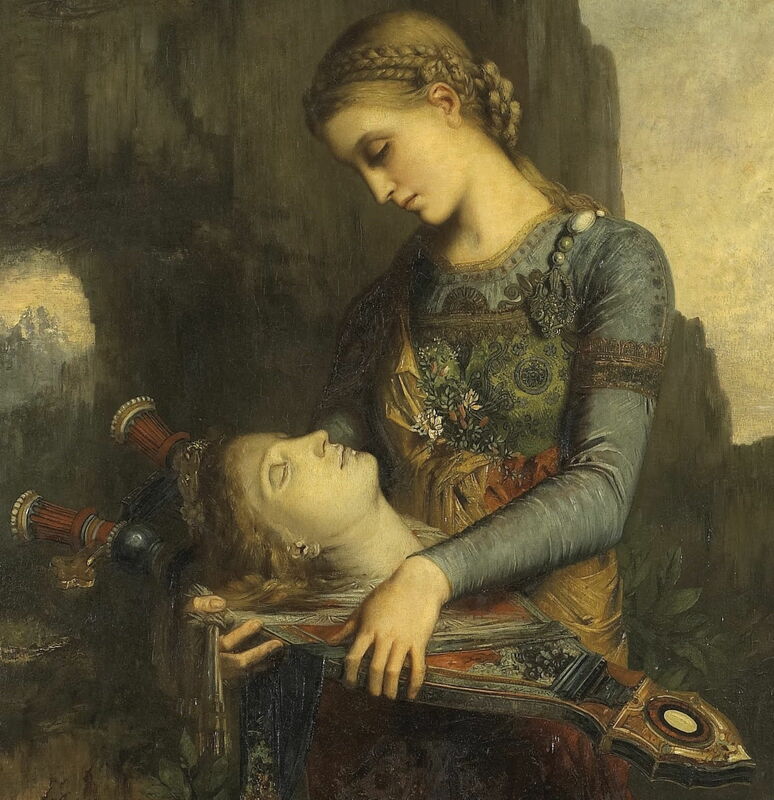 Waterhouse may well have seen Gustave Moreau’s painting, which had become popular with Symbolists of mainland Europe. A decade later, Waterhouse re-used his setting for another of his more aesthetic paintings, The Charmer (1911). Posted in General, Language, Life, Painting and tagged Bouquet, Lévy, Metamorphoses, Moreau, myth, narrative, Orpheus, Ovid, painting, Waterhouse. Bookmark the permalink.